A Teaspoon and A Pinch: What's In My Kid's Lunchboxes? Last year after seeing this video - I was moved to start sending lunches with my kids! 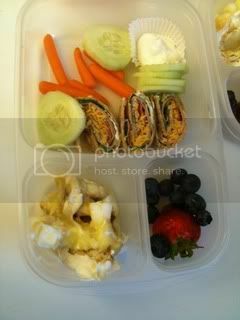 I am happy to be sending such colorful, good for them and healthy lunches. I am happy to report that they are still choosing while milk most of the time. Since then we have been learning a lot about what goes on in the lunchroom and classroom. This is a black bean, spinach and cheese quesadilla. My kindergarten told me this morning about the kid sitting next to him with a pop. The best part? He was outraged. Not out of jealousy...he knew it wasn't right. This is a ham, cheese, spinach and bacon roll up. My 4th grader gets to take a snack to school for after 2nd recess...he's a little bummed that I won't send chips like most of the other kids. His teacher put a ban on candy for snack...so I asked what's the difference between chips and candy - neither has nutritional value - he said Nothing. This is a ham, cheese and spinach sandwich. Every day I try to include fresh fruits and veggies. But all is not sad...all 4 of my kids flipped out when I sent a pear (like a real pear - just washed still in it's skin) in their lunch boxes. They were so excited - I guess it pays to talk up trying new things. 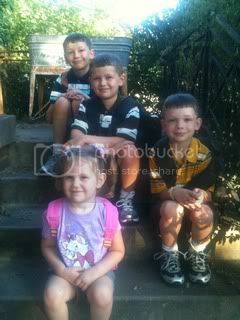 We have learned that if our kids are eating wholesome foods - they eat a ton more. I used to have a limit on the amount of food that they could eat...but who could say no to one more apple, banana or broccoli? They like things rolled up - this is just real peanut butter and real fruit jelly...but they love it. You'll notice that there are a couple of things that aren't really wholesome...like goldfish or banana pudding. I don't put a ban on things like this...I just put a limit on how many times I will include them. This way they are learning that it's OK to have them just not all the time. It also creates excitement when they do get to have a little junk. Do you send lunch with your kids? Wow! So many ideas all in one post! Thank you for the awesome inspiration!!! those are great lunches. I love those cute boxes where did you get those. My little one still eats lunch at home.. They are great. With 3 compartments I am forced to think about variety and portion size. GREAT ideas! 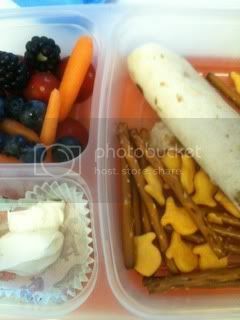 I love those lunch boxes too. Did you post the quesadilla recipe somewhere on the site already?! 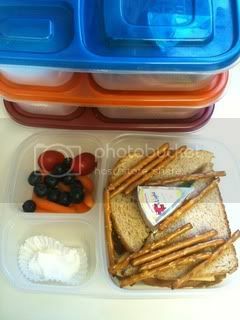 I was going to start packing my children lunches this year, because I was not happy with the school lunch program and quality of food. However, the school hired a new cook this year, with tons of culinary training and he is already implementing some fantastic changes including a daily garden bar with fresh fruits and veggies, and he will be making a lot of the food himself, versus just heat and serve. So I think we will give it a try again and see how it goes! Fabulous Melissa! What an inspiration. Will share this wonderful post and your great pics with my audience :) Love it!! For Black Bean Quesadilla's spray pan with cooking spray and place warmed tortilla in pan, cover lightly with cheese, spinach and black beans - add a small amount of cheese for glue when folding over. Easy peasy. 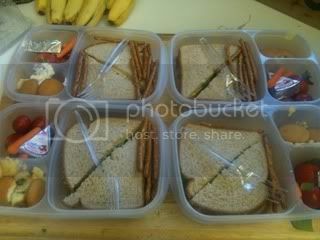 I plan to pack my kids lunches,this is our first public school year.I am doing it because my boys are ultra picky (I have no previous bad school lunch experiences). The ideas are very cute and healthy but if I tried to send this with my boys,it would come home the same way it left.There is not a chance of them eating spinach,no matter how I disguised it.Congrats on getting your kids to eat it though. 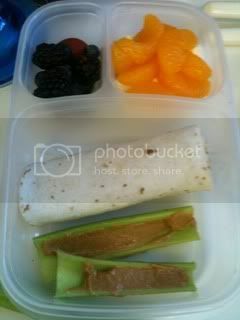 Don't get me wrong,I don't agree with all unhealthy food,I just have to go with what they will eat and make it interesting (wraps are a great way to do this). 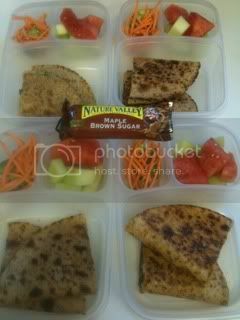 The boys like tomato wraps with turkey or chicken,light cheese and lettuce,tomato and onion. this is an awesome post mellisa!